Michael Bell was born in Neath and studied music at Cardiff University. After graduating, Michael formed Cardiff Philharmonic Orchestra in 1982 and has conducted the orchestra for 36 years. 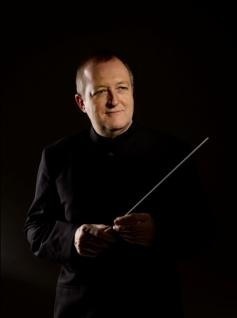 Michael has conducted an enormous and wide ranging repertoire with CPO, in almost 350 concerts, including symphonies by Mahler, Richard Strauss, Brahms, Tchaikovsky, Vaughan Williams, Elgar and Shostakovich, as well as major orchestral works by Stravinsky, Ravel and Prokofiev, and many more besides. Michael has always had a great enthusiasm for film music, and in 1994 introduced ‘A Night at the Movies’ as an annual feature of CPO’s repertoire. In December 2017 ‘A Night at the Movies’, celebrating the music of John Williams, was performed to the highest audience figures at St David’s Hall for thirteen years. In the New Year’s Honours 2018 Michael was awarded an MBE in recognition of his work with the orchestra, an award made particularly special to Michael because he was nominated for the MBE by members of CPO. Some things about Michael you may not know…he’s always nervous before concerts but enjoys talking to the audience; he doesn’t drive but is a keen cyclist and walker; he is an insatiable collector of cds but can’t figure out streaming or downloading music; he’s a terrible cook; his favourite tipple is red wine, and favourite meal is food cooked by anyone else! Jill was a founder member of Cardiff Philharmonic Orchestra in 1982 and became leader of the orchestra in June 2009. She hails from Pencoed, near Bridgend and after graduating from Cardiff University Jill has, through her role as a teacher, nurtured the talents of countless young musicians. 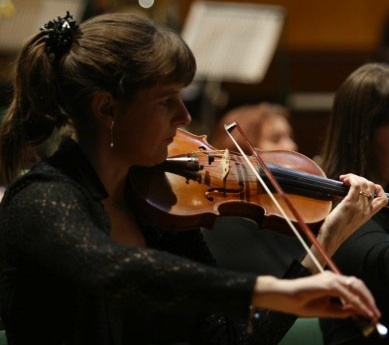 In addition to playing with CPO, Jill has also performed with other orchestras, including Rhondda Symphony Orchestra and the City of Cardiff Symphony Orchestra.